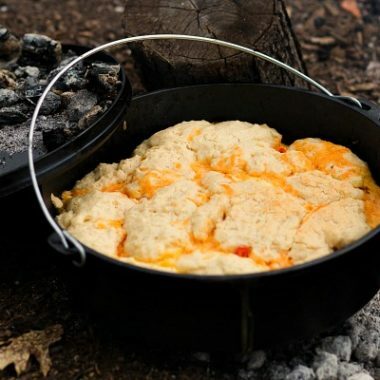 Growing up, we always had yummy dutch oven food. 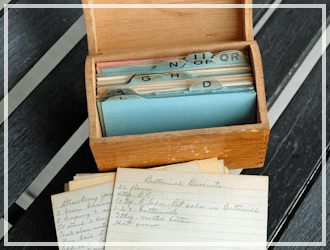 Whether it was my Dad teaching the boy scouts us kids eating the leftovers, or as a family when we were in the woods camping, he was always making some sort of new recipe in the dutch oven. His favorite go to recipe though, was this 5 layer dutch oven country breakfast that I am going to share with you today. 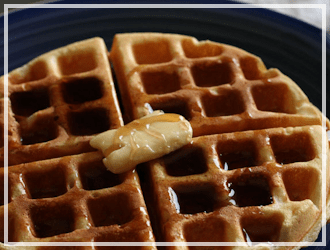 It is the perfect hearty breakfast for a day in the outdoors! 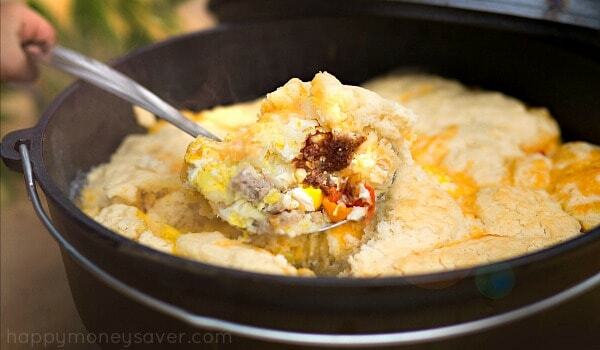 This dutch oven country breakfast really does have 5 layers! Wanna know what they are? There is ground sausage, hashbrowns, eggs, biscuits, and cheese! 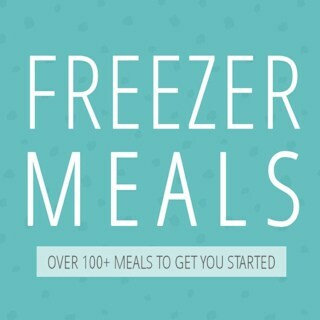 My favorite is to pre-package everything in ziplock bags and place it in the ice chest for a quick meal. 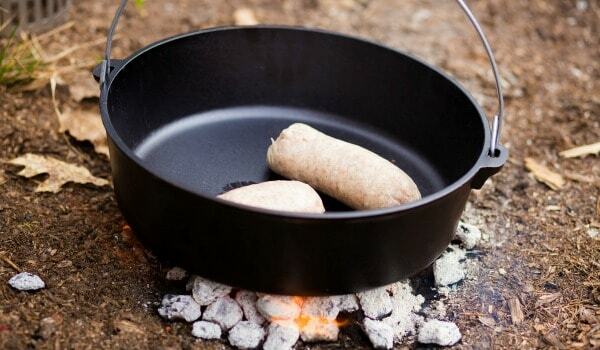 I love camping and cooking in the great outdoors. 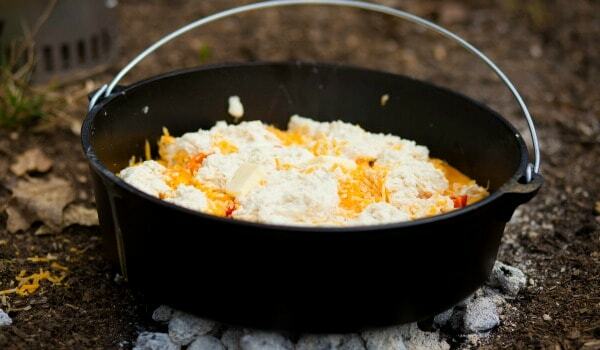 Check out my 10 Easy and Cheap Camping Meals post for more recipes. You know how all food tastes that much better when you’re camping? Why is that? I know one thing, this recipe is NOT like that. It isn’t only good because you’re dirty, starving, and feel like you’ve been eating junk food all day. My 5 layer dutch oven country breakfast stands on it’s own! 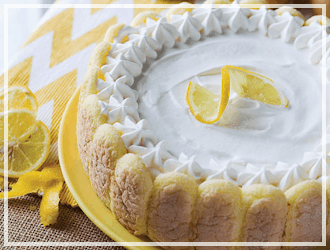 It is delicious any day and any time! 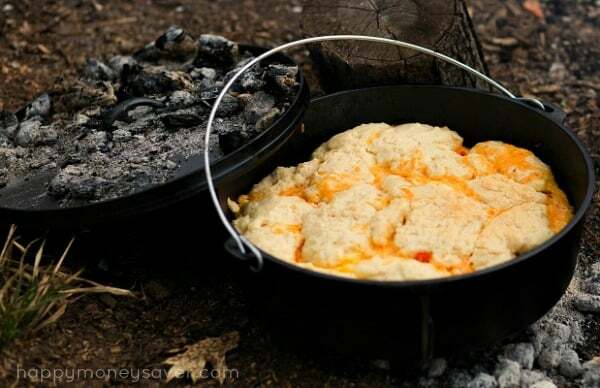 However, this is my favorite camping recipe, so this summer when you are planning your big family campout, be sure to grab your dutch oven, print off the recipe and make this amazing camping meal. 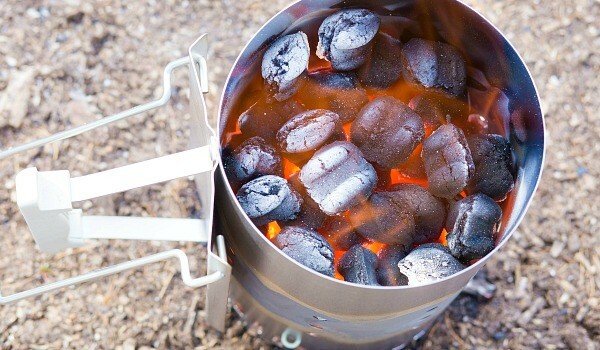 Heat up some charcoal briquettes. 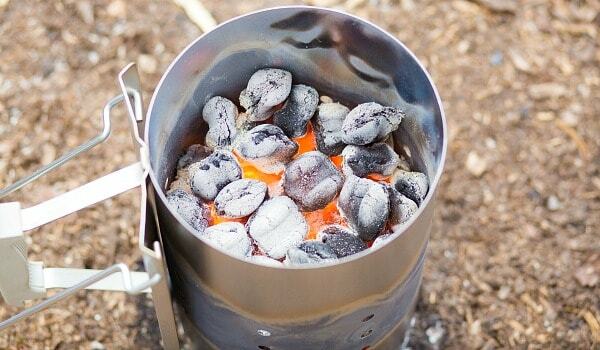 I love using this chimney charcoal starter. 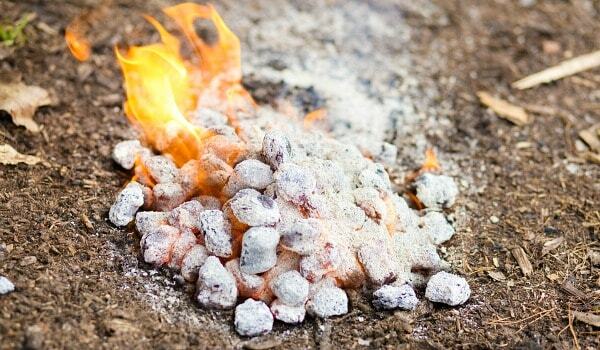 Once the coals have begun turning white, you are ready to start cooking. Dump out the hot coals and be careful not to get burned. · place 2 less than the oven size under it. So for my 12 inch dutch oven, I would place 12 +2, a total of 14 on the top. For the bottom, I would put 12-2 for a total of 10 hot coals. 14 + 10 = 24, which is the total diameter times 2. Have I confused you yet? Using this method and laying them out in a circular pattern and placing them evenly should give you a temperature of 350 degrees. 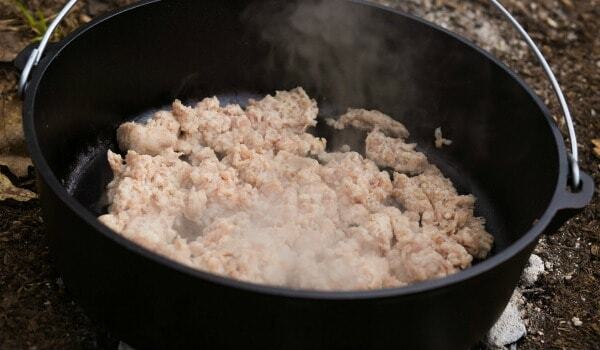 Place the dutch oven over the proper amount of hot coals and cook the sausage until browned. Pour a bag of hashbrowns right over top the sausage. Third layer is a dozen eggs. One thing that’s great about having chickens is beautiful endless eggs. 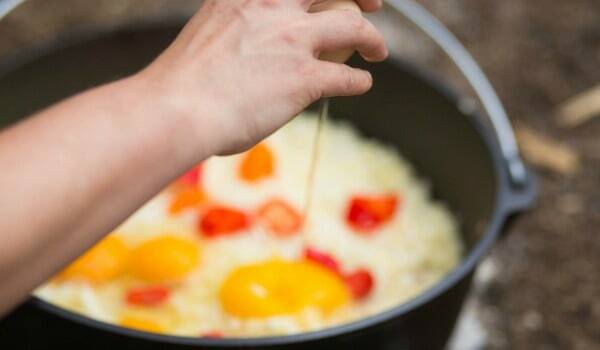 Crack the eggs and place evenly across the surface of the hash browns. 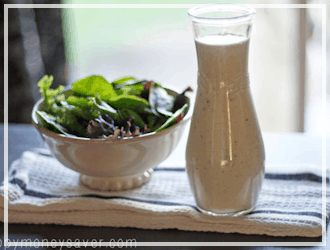 If your little on the crazy side, feel free to make this into a 6 layer breakfast and spice things up by add in some peppers or onions here (like my husband did). Me? No thank you! I will just pick around those, but he loves them! I like to sprinkle a little salt and pepper here over the eggs. 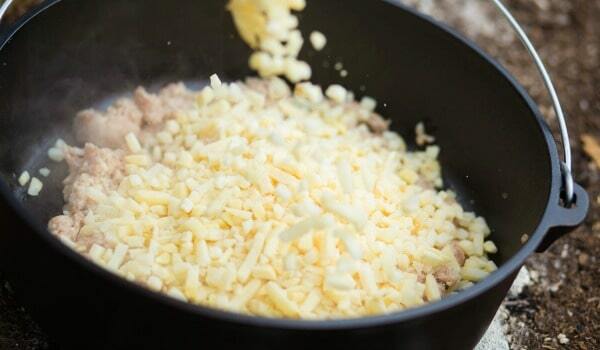 Sprinkle on 2 (or 5) cups of cheese. I am crazy about cheese and often over do it, but I guess 2 cups will do. Using some long handled tongs Cover that baby up and add the hot coals to the top. Now sit back and wait for about 45 minutes or until everything is cooked through and the eggs are set. When you lift the lid, your tummy will grumble and you will sing hallelujah! Breakfast is ready! I am telling you, breakfast never tasted so good! 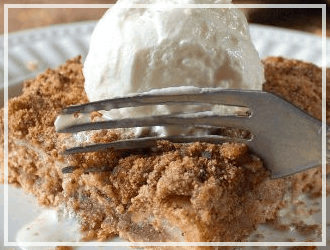 You will love this dutch oven recipe, I promise! After looking at any of these camping posts, I am sure you will find something useful or helpful to make your trip awesome! 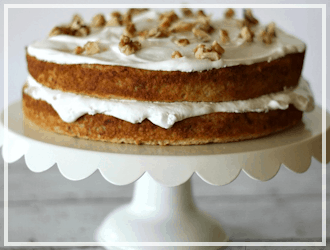 Below I have added a printable recipe card for you. Happy Camping! 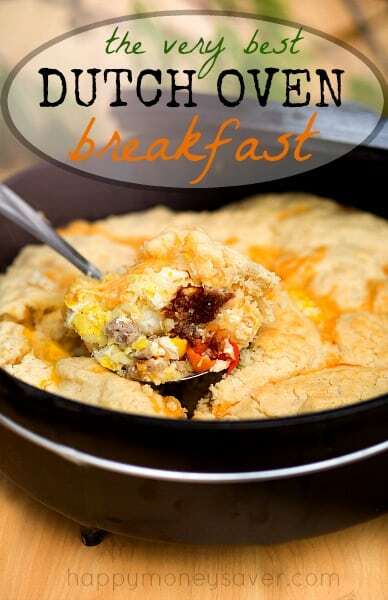 7 Layer Dutch Oven Country Breakfast is a delicious healthy Breakfast! While the coals are heating up place the dutch oven over then and cook the sausage until browned. Remove from heat and pour the package of hashbrowns over it. Then crack the 12 eggs over the potato layer as evenly as possible. 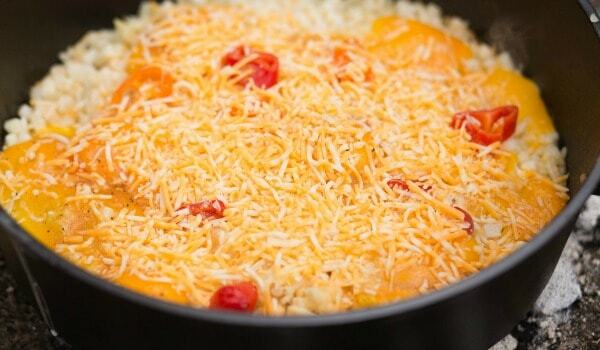 Sprinkle the cheddar cheese as the next layer. Then place the biscuits all over the cheese or homemade biscuit mix. 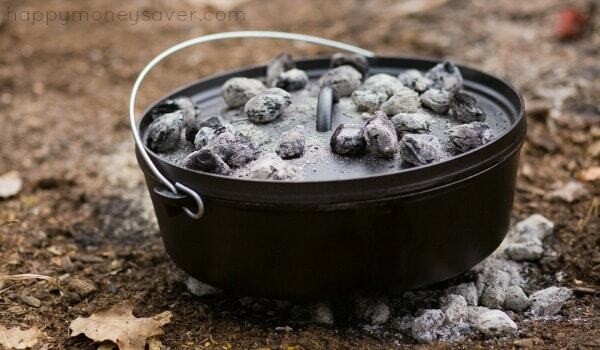 Cover the dutch oven and then add coals on the top and bottom of dutch oven. Allow to cook for 45 minutes. Serve. 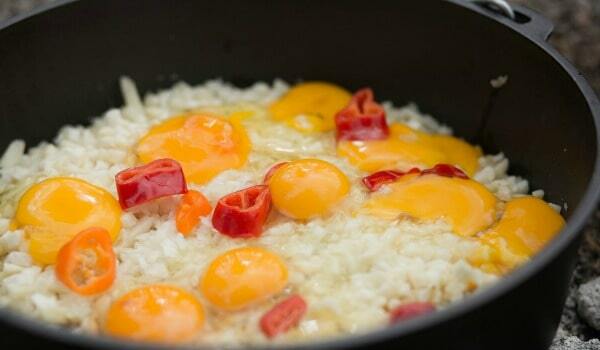 Gonna make this breakfast this weekend…Can you double this recipe in a 14 inch dutch oven? Any way you could make this in a crock pot. We are spoiled,don,t do outside fire cooking. Just reread your articular. Good instructions on amount of coal to use. Sorry I wasn’t observing enough the first go around. Not very helpful for someone trying to learn how to cook in a dutch oven outdoors. No where did you share how many coals on top of the DO or bottom. This is vital information to be successful in cooking this dish. Shame on you. Should have stated: 8 coals on bottom and 16 on top. I’m going to try your version this weekend. I tried something similar with biscuits and cracked eggs last year when we camped and the biscuits (canned) got too done and the whole eggs took way to long to “set”. I would love to leave them whole (unscrambled) but am nervous. Any advice? Also, I am thinking that the homemade biscuit mix will make a thinner layer of biscuits so they will cook better than the huge canned ones. 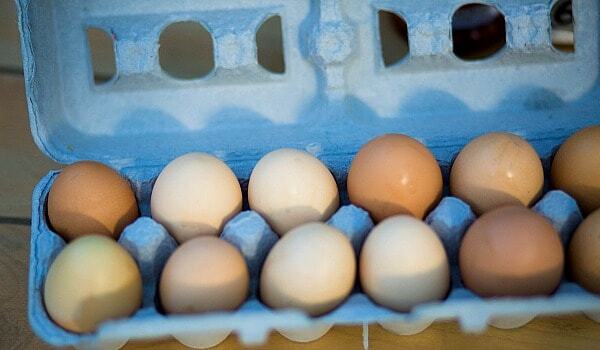 Do you break up the eggs or just leave them whole? You can do either really! But I like to crack them and leave them whole. 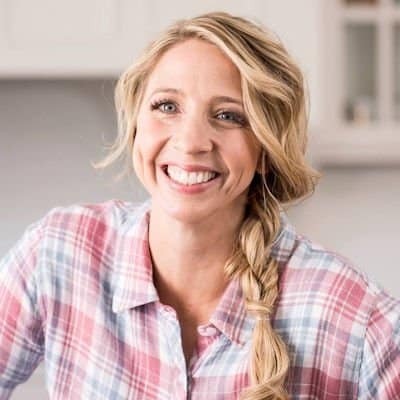 What would you recommend for doing a double recipe? Keep the same cooking time? What constitutes a ‘small package’ of sausage? 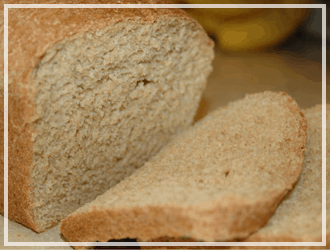 Looks like it could be a 1 lb roll (so 2lb total for the recipe), in the picture, but could be something else. Part of me says you can never have too much sausage, but I’m worried that overdoing it would lead to a very greasy result. This is going to be my first Dutch Oven attempt with Scouting, so I’m nervous but hoping to start off with a winner. Your directions on the coals was much appreciated. Can I use another meat instead of sausage? Would ground turkey or bacon be easy substitutes? Absolutely, you can use ground turkey, but if you did you would need to add some spices to make the meat taste better, like sage, salt, pepper, onion and garlic. I just read this recipe. 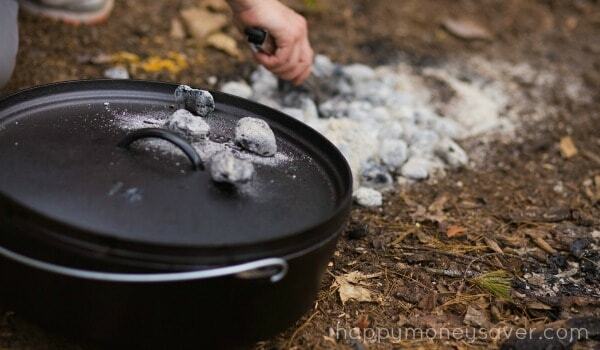 Thank you for taking the time to tell us all how to use Dutch oven. This was the best and easiest to understand. I’m thrilled and can’t wait to try this recipe. Maybe I’m missing it… But do you drain the grease or if the cooked sausage before adding the hashbrowns? There was no response to the charcoal question. Can you please clarify? I’ve made this last year, and I’m about to again this weekend. It only takes 14 coals on top, looking at the picture I’m thinking some of the coals broke up and that’s why it looks like more than 14. This looks wonderful. But I have a question about the number of charcoal pieces – you say in your text that you would use 14 on the top and 10 underneath for your 12″ dutch oven. But in the photo I count 24 or 25 charcoal pieces on the top. 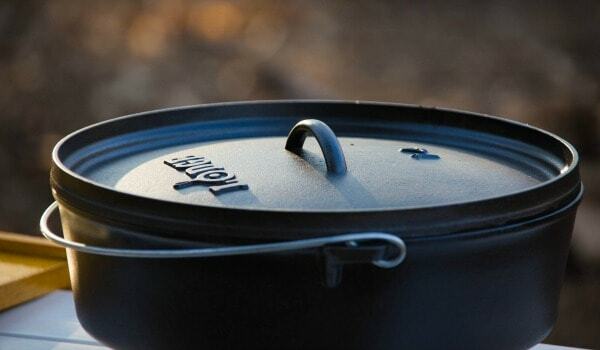 Please clarify – this is the hardest part about dutch oven cooking for me! I just made this 7 Layer Dutch Oven Country Breakfast and it was the best healthy breakfast ever! Thanks for the awesome recipe. Can’t wait to make more them. I’ll have to tell my husband about this. 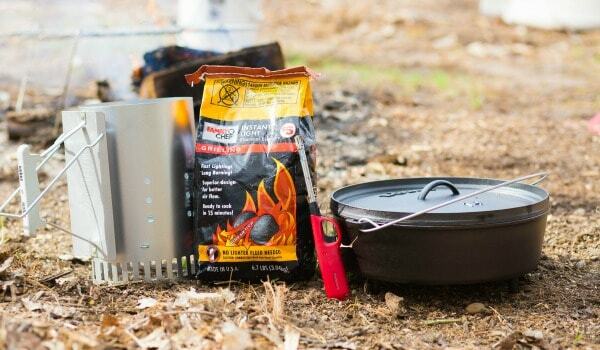 He loves campfire and dutch oven cooking! I was thinking the same thing. Looks like raw dough from the picture? Trying it this week…. Make the bisquick recipe for biscuits and plop on top. 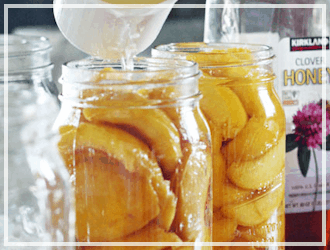 This would be such a fun recipe to try this summer with the kids! 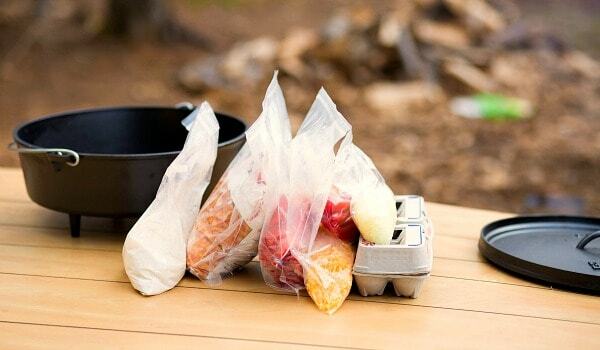 I’d love to see more camping type recipes like this through the summer. Could you make this in a Dutch Oven on the stove? Yes absolutely – it would need to be in the oven though, not on top of the stove. So 350 for 45 minutes and the middle hashbrowns were s and still cold.